I do not intend to restart this blog, in the sense that there will not be any regular new posts. But every if I find something interesting then I may publish it for the benefit of other builders. If you are like me and like to put your next idea into the form of tangible bricks, then you need to get those bricks from somewhere. Unfortunately the LEGO company considers the sets their primary product, and while they do sell bricks online, it is not always the best option. Bricklink (and BrickOwl) is usually the way to go, but if you intend to buy a lot of bricks, even that is going to be expensive. On the pro side, this can be quite a good deal. In the US, you can fill a large cup (about a pint) for $15.99 + sales tax. My unscientific guess is that it holds at least 400g worth of bricks. There is also a small cup for $7.99 + tax but it holds less than the half of the large one. On the con side, the selection of bricks is still quite limited. Typically you have 6 rows and around 26 columns which gives you around 150 color-part combinations. What is available is usually a good deal, but you can clearly not expect everything. 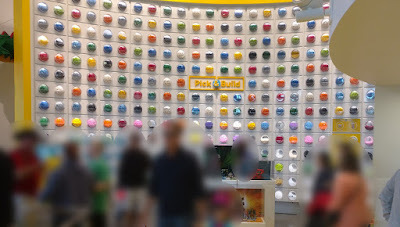 This is how the Pick-a-Brick wall looks like in the LEGO Store Disneyland in Anaheim, CA. There is even a website dedicated to keeping you up to date with the latest selection. A word of warning: this may or may not be updated regularly. 2. Legoland Germany. This is clearly only an option if you live near the city of Ulm or you have a chance to go there. 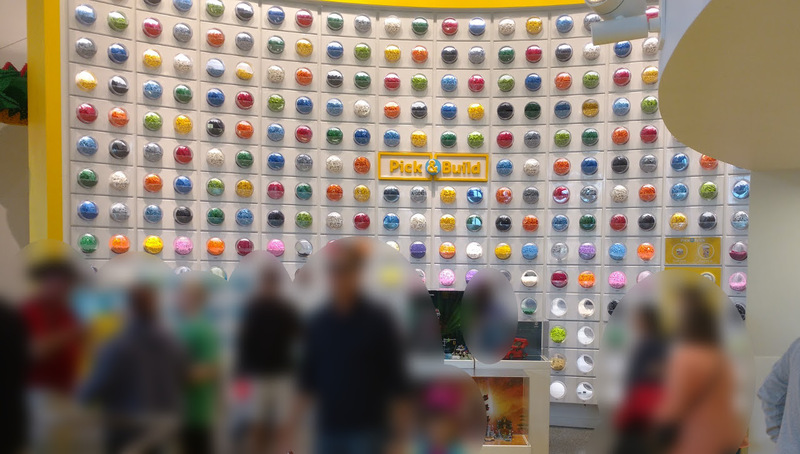 Legoland Germany has by far the best pick-a-brick selection from any store officially affiliated by LEGO. I have to admit that I have not been to Legoland Windsor or Billund recently - if you have info on that, that is appreciated. Pricing is different, last time I checked it was by weight and it was EUR 8.99 per 100g. Pro: The best selection amongst offline shops. Probably around 1000 part-color combinations if not more. You still cannot expect all. Con: slightly more pricey than the LEGO store walls. 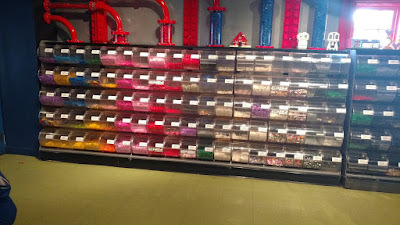 So my question during my California visit today was - how does the brick selection of Legoland California hold up? Since this is a big trip for me I did some online research before. There were some indications that it will not meet my expectations, but still was curious about the truth. Well, to summarize: it does not hold up at all. The park itself is pretty similar to Legoland Germany, with one minor difference: the pick-a-brick wall is basically unusable. You can find some bricks and buy them by the weight, but if your goal is to buy bricks, go to the closest LEGO store. 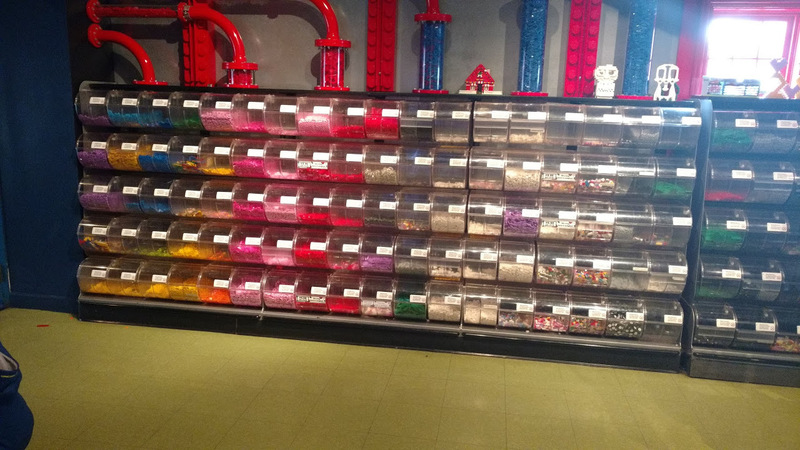 You may be able to find some bricks, that are not in a Lego store, but the selection is the same or worse. Lesson learned: if you have seen other Legoland parks, this will be the same. And definitely do not go there for bricks.